This conference just ended, but videos will be made available. You can purchase access rights to 14 hours of teaching and ministry for only $30.00. Click the Register button to your right. Live Streamed sessions will be recorded and made available following the conference. Details to be forthcoming. 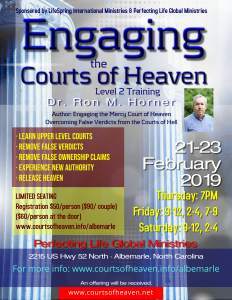 This Engaging the Courts of Heaven Seminar will be hosted at Perfecting Life Global Ministries in Albemarle, North Carolina. Our hosts will be Pastors Brian and Karissa Johnson, pastors of Perfecting Life and Dr. Ron & Adina Horner of LifeSpring International Ministries. Adina will lead us in worship with her beautiful and anointed music. The dates are Thursday through Saturday, February 21-23, 2019. Thursday evening we will start promptly at 7:00. 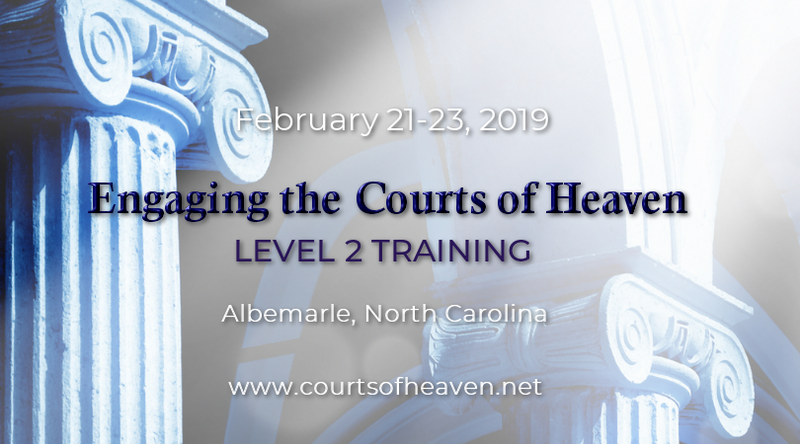 The Thursday evening session will lay the groundwork for the conference which will teach you about successfully “Engaging the Courts of Heaven.” Friday, we will continue our teaching on these upper level courts. Saturday we will engage participants in the Courts of Heaven particularly for their ministries and families. You will be provided some practical tools to assist you in excelling in the Courts of Heaven. It is our prayer that upon completion of this seminar, you will be able do all the things listed above and begin to see even more rapid changes in your life and family, your churches and ministries, as well as this state, this nation, and the nations of the earth! This seminar is not for those unfamiliar with the Courts of Heaven and our books and materials. If you have not listened to the Level 1 Seminar, do that first before registering. To view the Level 1 Training, CLICK HERE. Contact us to schedule a seminar. Thank you Dr. Horner, after this session, for the first time in 5 years of marriage, I experienced a breakthrough to be the only bride of my household. There were visible winds of change even in the weather all night. Next day, I received a double portion of blessings and recognition. The veil of oppression lifted over my marriage. Thank you for addressing the unspoken and exposing secrets of darkness to help bring freedom. Double portion blessings to your ministry. Interested in learning about the Courts of Heaven?